I have a confession. I LOVE this messy hair up in ponytails and buns business. I just love it. But I’m scared of it. I have a round face, my nose is too short, and my chins…well…there are a few of them to choose from. This is the kind of self-attacking that happens every time I pull my hair back into a ponytail. And it is time that it stops. I have great hair (even if it’s thinning) and I love the look of a good ponytail. So, today’s the day that I embrace that. Today is the day that I decide to wear a ponytail because I like to and not just because it’s a good distraction from skipping a hair wash for the day! I have become more and more aware (and more and more saddened) at how much self-attacking I do even in the little things. And we all know that a lot of little things make bigger things. Just think of the little comments you make to yourself throughout the day when you pass by a mirror or run into someone you think is cuter than you. 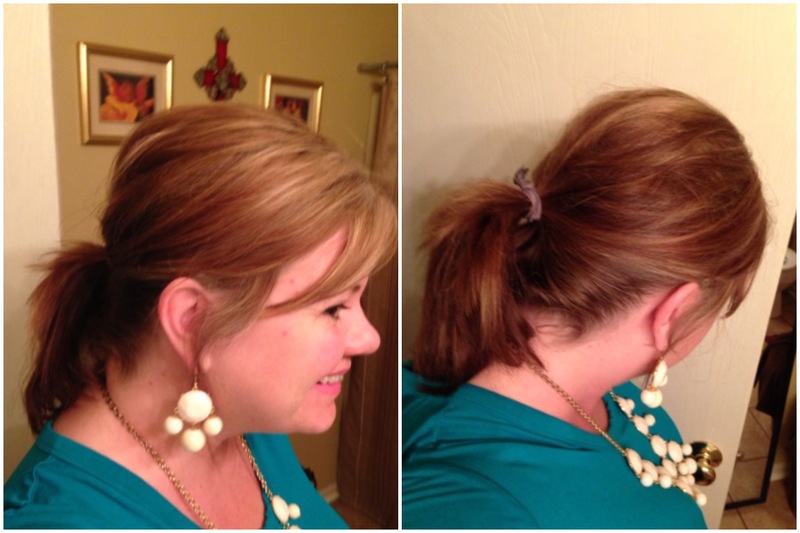 So, do it ladies (and gents if you’re so inclined)….embrace the ponytail. Say “screw you fanned hair look around my face to seem thinner”……let the world see your face…..and the cute ouchless bands you choose to pull it back with! !